Fall has definitely arrived here in the PNW. For the most part the leaves have changed color and fallen off the trees. Rain has settled in and we are already complaining about the grayness of the days. The evenings are getting colder, before we know it we will be scraping ice off the cars in the morning. When the days are dreary, the best thing to brighten them is a warm fire, a good book, and a hot cup of tea (or coffee). Homemade fresh soup with a grilled cheese sandwich or a Panini has got to be a close second. We were in just that mood this past Tuesday. It’s been raining and cold here for the past few weeks. I was in the mood for a Panini and I asked Liz if wanted a grilled cheese sandwich. She asked if we could have soup with it. Tomato soup was her suggestion, but not the store bought kind. 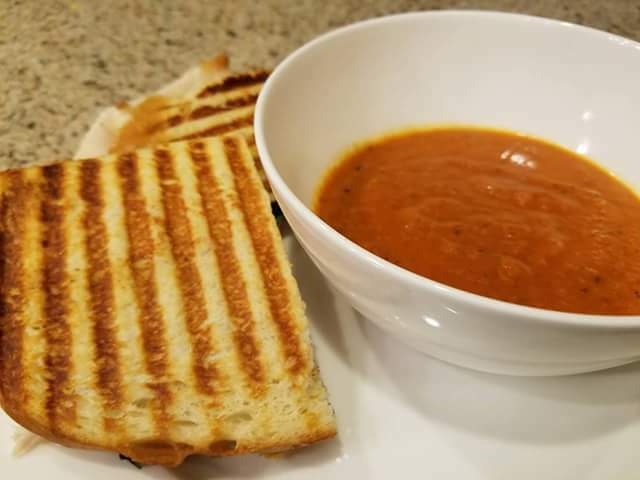 I have never made tomato soup before. I figured it wouldn’t be too hard, I went to Pinterest and looked up recipes. The first recipe I clicked on started with bacon. I looked no further. Anything that has bacon in it has to be good right? We picked up all the ingredients and headed home. The recipe is fairly straight forward. Chop two carrots and half a yellow onion and set it aside. Chop four to five pieces of bacon. In a large sauce pot, fry the bacon 8-10 minutes until brown. Add the carrots, onion, and garlic and sauté until soft fragrant. Add one tablespoon of flour and stir. Add one and a half tablespoons of tomato paste, stir and allow to cook until brown. Add one 28 ounce can on San Marzano tomatoes, ½ teaspoon of dried thyme, and a bay leaf. Liz wanted to add some of the Penzy’s Pizza seasoning. She added a teaspoon of the seasoning. Allow the soup to simmer about 30 minutes. Work in batches blend the soup until smooth. Serve! My favorite panini is made with sourdough bread, Beaver Sweet Hot Mustard, turkey, salami, havarti cheese, and basil. Steve prefers sourdough bread, pastrami, pepperoncinis, pepperjack cheese, and basil. I made the grilled cheese with Tillamook Sharp Cheddar on sourdough bread. Honestly, the sky is the limit with flavor combinations for panini. I was also curious about San Marzano style tomatoes. I know there are generally differences between tomatoes, but had no idea what makes San Marzano tomatoes so special. I took some time and did a little research. True San Marzano tomatoes are grown in in the Agro Sarnese Nocerino area under Mt. Vesuvius near Naples, Italy. They are labeled Denominazion d’Origine Protetta (or DOP) if they are truly grown in this area. The variety of tomatoes can be grown elsewhere but like Champagne can only be labeled if it comes from France as it is sparkling wine from California. The San Marzano is an heirloom plum tomato with a low seed count, known for its sweet flavor and low acidity. Another interesting fact is they are harvested by hand by an older generation of Italian Farmers called “contadini”. Add the tomato paste - stir for a few minutes until you can see/smell the tomato paste starting to brown and caramelize. Add the flour and stir for a minute or so. This entry was posted in sandwich, Soup. Definitely adding this to my ‘Must Try’ collection of recipes! !